Tehuitzingo, a Mexican bodega on 10th Avenue between 47th and 48th streets, has been closed by the Department of Health due to permit issues. The landlord is also rumored to have doubled the rent for the space, Midtown Lunch reported. Garrett’s Popcorn on the corner of Fifth Avenue and 46th Street has closed. 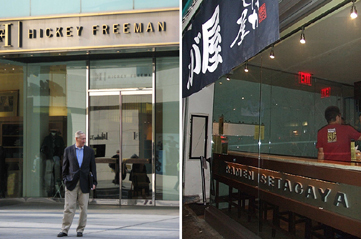 Hartmarx Corporation may close the Hickey Freeman flagship store at 666 Fifth Avenue. SophieRoan, at 117 East 7th Street between First Avenue and Avenue A, is closing at the end of March. Tahini on Third Avenue at St. Mark’s Place is temporarily closed, as is Ryan’s Irish Pub on Second Avenue.